The 1970’s are referred to as the era of the Blue/Olive badge. 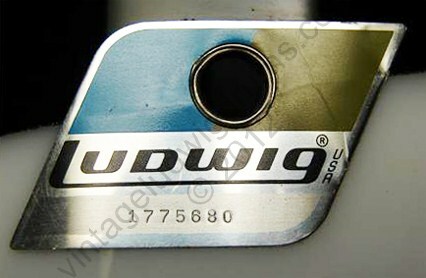 Ludwig badges are simple characteristic indicating which era a Ludwig drum could be placed. The 70’s blue and olive badge started as rhombus shape with pointed non-continuous lower left and upper right corners. Ludwig drums could also be identified even further, than simply from the badge, into a specific time period of the 70’s by the construction of the shell, and the hardware used throughout the drum. Ludwig shells from 1970-1975 carried the 3-ply maple/ poplar/ maple with the re-enforcement ring construction of the late 60’s. Shells from the early part of the 70’s have clear interiors. Whereas most of the shells after about ’73 received a granitone coated interior. But by 1976, their method of construction for drums had changed drastically. Classic series drums were made of a new mold. Shells now consisted of 6-ply maple/poplar mix without reinforcement rings. All shell interiors were now done as a clear coat, exposing the grain of the wood. Bass drum spurs were also among notable changes that Ludwig shell hardware made, marking transitions in design from the 60’s and into the 70’s. Retracting, 5/16”, arched curved spurs were introduced in the 1970 catalog, however, existing as early as 1968. 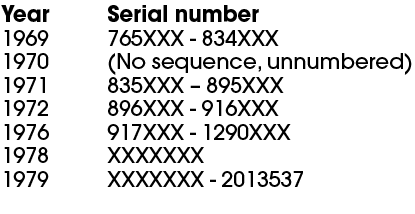 By around 1977, a thicker, 1/2”, curved spur was introduced for more support. Tom mounting brackets had a slight variation in the 1970’s. The second generation script logo bracket was still in use throughout the 70’s. There was however a second generation circled sliding clip mount used in the 70’s. These clip mounts were featured as early as ’68, but became more evident in the 1970’s. In 1979, Ludwig introduced modular bracket and the redesigned blue/olive badge with all four corners rounded. Here are the three different bass drum mounts used throughout the 70’s- in order from earliest to newest. The black plastic handle started around mid 70’s. The last two are still being offered today.